The controversy surrounding football concussions isn't going anywhere, as long as 300 pound dudes continue to crash into one another with abandon. 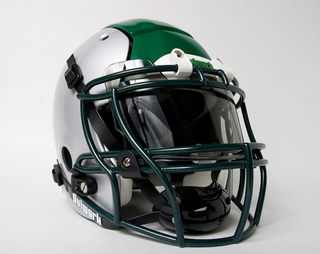 So rather than taming the game, industrial designer Michael Princip wants to rebuild the helmet. Tougher. Not dorkier. Princip's baby, the Bulwark, is a little bruiser. It packs three layers onto your dome—a top layer, split into separate (and color-swappable!) panels, a padded middle layer, and another stiff layer underneath to make a sandwich. The idea behind the separate layers is to isolate the impact from that gargantuan linebacker into one of the panels—rather than letting it dissipate throughout the entire helmet (and into your mushy brain). This paneled design, plus the layer of padding, minimizes the shock that ever hits you, and just might keep you from being knocked silly. The thing also looks pretty damn good, considering that adding "safety" before any object usually means it looks like it was designed for idiots. But being stared down by the Bulkwark would still be pretty intimidating, despite the adjusted form. And even with all its advantages, the Bulwark is still a pound lighter than the competition. But therein lies a problem. The competition. Big companies like Riddell and Schutt are pretty deeply entrenched in the helmet biz, and a single man operation like Princip's probably doesn't stand a chance. That's okay though—he plans on licensing out the tech once he gets a functional prototype together (another slight hurdle).